He survived the “endurance test” of the group stages before starting to score more heavily in the knockout. “I do enjoy it more when there’s more space around the tables and you can get into a rhythm,” said Hunter. Bournemouth-based Carl Davies missed a far-from-easy black on a break of 44 in the first frame of the final and Hunter produced a 34 clearance to the black to take the lead. The latter stage of the second frame was dominated by safety play until Hunter rolled a pink along the top cushion to secure a 2-0 victory. Paying tribute to Davies, whom he had lost to in the group stages, Hunter added: “Carl is deceptive. “He knows how to lay evil snookers. He knows his way around a snooker table, that’s for sure. Earlier, Hunter, now dubbed ‘Flakey’ after the popular ice cream, missed an easy black off its spot on a break off 99 in the first frame of a 2-1 quarter-final success over fellow World Seniors Tour player Simon Dent (Shoreham-by-Sea). He then added a 66 in a 2-0 victory over Dean Sycamore (Chichester). Leg-one winner Jon Charlton (Haslemere) missed out on qualifying for the knockout by one frame. Nick Birney and Neil Carroll share the hard luck story of the day. 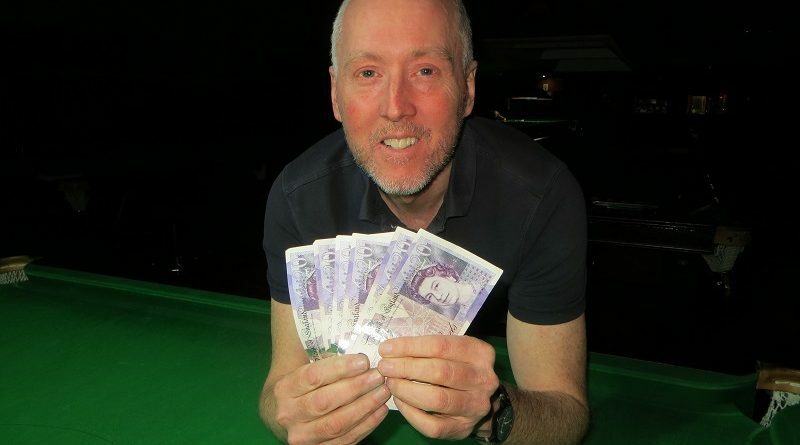 In the battle for top spot in their group, Birney (High Wycombe) produced a 62 break in the deciding frame of his last match against Dent – and still lost. And Carroll (Rownhams) missed out on the knockout on the head-to-head rule despite winning four of his five matches. Mike Quinnell (Bexley) marked his Cuestars debut by reaching the semi-finals where he lost 2-1 to Davies. Herman Desmier (Wimborne) retains the lead in the Masters (55+) rankings by two points from defending champion Phil Morgan (Salisbury). The 23 runners for the event sponsored by Dransfields at Fareham Snooker Club recorded 24 breaks of 40 or more. Greenbaize Snooker Club, Bournemouth, hosts the third leg of eight on Sunday, November 11. John Hunter: 99, 66, 48, 46. Dean Sycamore: 73, 45, 44, 43. Simon Dent: 62, 59, 49, 48, 41. Nick Birney: 62, 48, 41. GROUP A: 1st, Paul Lawrence (Park Gate RBL); 2nd, Mike Quinnell (Bexley); 3rd, Lawrence Millington (St James Inst, Bournemouth); 4th, Jon Charlton (Aldingbourne Social Club, Chichester); 5th, Herman Desmier (Bournemouth & District Constitutional Club). GROUP B: 1st, Carl Davies (St James Inst, Bournemouth); 2nd, John Hunter (Salisbury SC); 3rd, James Height (Break N Dish, Street); 4th, James Trump (SWSA, Gloucester); 5th, Ian Desmier (Break N Dish, Street); 6th, Stephen Hills (Traders, Northfleet). GROUP C: 1st, Wayne Muddiman (Chandlers Ford Central Club); 2nd, Dean Sycamore (Chichester City Club); 3rd, Neil Carroll (Chandlers Ford SC); 4th, Darren Johnson (Petersfield Bowls & Snooker Club); 5th, Dan Hammond (Chandlers Ford SC; 6th, Jackie Ellis (147 SC, Swindon). GROUP D: 1st, Simon Dent (Castle SC, Brighton); 2nd, Nick Birney (Liberal Club, High Wycombe); 3rd, Martin Wallace (Crucible, Newbury); 4th, Neil Herd (Salisbury SC); 5th, Phil Morgan (Chandlers Ford SC); 6th, Andrew Darken (Chertsey SSNR Club). QUARTER-FINALS (12 points): Sycamore 2-1 Lawrence, Hunter 2-1 Dent, Davies 2-0 Birney, Quinnell 2-0 Muddiman. SEMI-FINALS (15 pts, £25): Hunter 2-0 Sycamore, Davies 2-1 Quinnell. FINAL (25/18 pts, £120/£60): Hunter 2-0 Davies.